Cherry Tomatoes - Live Long and Prosper! One of my earliest childhood memories is wandering through my grandmother’s vegetable garden and coming upon an early prize – a cherry tomato, Lycopersicon esculentum. Like many Sonoma County gardens, her garden was pesticide-free and nourished by compost. So, I was free to pop one of those juicy gems in my mouth. My delight with cherry tomatoes has not diminished with age: cherry tomatoes provide an early and long-lasting tomato harvest. When you are choosing tomato varieties to plant and salivating over large, luscious slicers for sandwiches and salads, add at least one cherry variety for garden snacking and extending your harvest. Cherry tomatoes grow well in Sonoma County and produce abundantly – one standard plant is sufficient for a family of four. 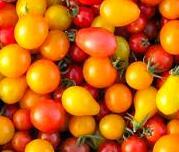 There are a large variety of cherry tomatoes – ranging in size and taste. If you have very limited outdoor space, a patio or dwarf plant is suitable for a 5-gallon container or a hanging basket. Because container varieties generally are shorter-lived, stagger plantings if you have space. Cherry Grande – medium-sized plant with large cherry fruit. This plant is “determinate” meaning the plant’s fruit tends to mature about the same time. Sweet Cherry – large plant with medium to large cherry fruit. This plant is “indeterminate,” i.e., fruit ripens over a long period of time. Sweet 100 – large (up to 7 foot) indeterminate plant with clusters of small cherry fruit. Sungold – large indeterminate plant with clustery, orange cherry fruit. Patio – dwarf determinate plant with small to medium fruit. Better Bush – compact determinant plant with small to medium fruit. Small Fry – compact determinate plant with small cherry fruit. Husky series – compact indeterminate plant with red-pink, gold, medium-small fruit. I prefer Sungold with its sweet taste, beautiful color and short days to harvest (60 days). They are delicious tossed with fresh basil, mozzarella, balsamic vinegar and olive oil. Master Gardener Mike Hawkins’ favs are two indeterminate heirlooms: Alisa Craig with 6-8 tomatoes in each cluster (good taste; slightly acidic) and Isis Candy with small gold-striped tomatoes (sweet, rich flavor). Select varieties that are disease-resistant (look for VF after the cultivar name) and periodically rotate the location of tomato crops in your garden. If your heart is set on a specific heirloom, practice good cultural care as it is unlikely you will find a disease-resistant variety. Plant in a sunny location when all danger of frost has passed. If planting in containers, use commercial potting soil or your own potting mix – not soil from the garden as water in containers drains differently. Set 6 to 8-inch transplants in the ground covering the stems so that only two to three sets of true leaves are exposed. Rooting will occur along the stem producing a stronger plant. The soil of new transplants should be kept evenly moist (not wet) for the first 3 to 4 weeks. Thereafter, water when the soil dries to about 2 to 3 inches. Many tomato problems are the result of over-, under-, and uneven watering. Mulching conserves water during our hot, dry summer. Do not over-fertilize, which will produce more vegetation than fruit. Best to prepare your beds with aged steer manure and well-decomposed compost, which provides slow-release nitrogen. Check plants often - caught early, most pests can be kept in check (eliminate soft-bodied aphids with a jet spray of water, but don’t knock off blossoms or fruit; hand-pick caterpillars; trap slugs under a board; capture white flies with yellow sticky tape or use garden cloth to exclude them). As they grow, support large tomato plants with cages or stakes. Pick your cherry tomatoes when they are red ripe (or other variety optimum color) for best quality – and enjoy a long and bountiful tomato harvest!